Following the death of his young daughter, the narrator moves to Japan with the project of writing an essay on Japanese literature. There, on the other side of the earth, he experiences a series of incidents that connect him to a recurrent childhood dream and allow him to explore the depth of his own grief through the stories of others. Sarinagara is a poignant meditation on the nature of grief, art, and memory. In Japanese, "Sarinagara" means "and yet." This word is the last word of one of the most famous poems of Japanese literature. Born in Paris in 1962, Philippe Forest is the author of numerous essays on art and literature and of three novels, all published by Éditions Gallimard: L'Enfant éternel (The Eternal Child, winner of the Prix Femina for a first novel in 1997), Toute la nuit (All Night Long, 1999), and Sarinagara (winner of the Prix Décembre in 2004). He is currently a professor of literature at the University of Nantes, specializing in avant-gardes. Pascale Torracinta is a translator whose essays, reviews, and translations have appeared in several magazines on both sides of the Atlantic, including The Threepenny Review and Poetry Northwest. She has taught French Literature at the University of Oxford and at the University of Geneva. She lives in Boston. 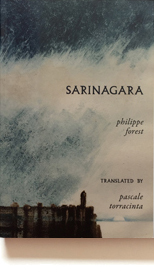 Originally published in French as "Sarinagara" (Éditions Gallimard, Paris, 2004). Cet ouvrage, publié dans le cadre d'un programme d'aide à la publication, bénéficie du soutien du Ministère des Affaires étrangères et du Service Culturel de l'Ambassade de France aux Etas-Unis. This work, published as part of a program of aid for publication, received support from the French Ministry of Foreign Affairs and the Cultural Services of the French Embassy in the United States.